1) JUNE IS HERE...ARE YOU READY? JUNE IS HERE...ARE YOU READY? June is once again setting up to be one of the busiest months of the year at LiveWorkPlay, and as usual it has a habit of sneaking up on us all with all the wonderful distractions that the spring season can bring. There will be a LiveWorkPlay delegation of 14 heading off to Kingston for the Community Living Ontario 56th Annual Conference June 3-5. There is room for more and it would be especially great to have more family members in the mix. Contact Keenan if you are interested. On your way back from the conference stop off in Perth and join in the fun of the 5th annual Roger Dodger Volleyball Tournament for LiveWorkPlay which runs June 5-7 at the Tay River Trent & Trailer Park. Contact Ron for more information. This year's Visioning Day & Pool Party event on June 20 is going to be a very special time, as we welcome guests Noreene Adam and Paul Melcher from Community Living Upper Ottawa Valley. Noreene wears many hats, including that of the mother of an adult with an intellectual disability. Paul is the Executive Director, and has shared in the journey of Noreene and other family members who have supported people with intellectual disabilities to follow their own path in life. This is a FREE event, but you must register by June 15. The pool party that follows Visioning Day is a great place to get a buzz going about the Engines of Success recognition banquet on June 25. This year there will be a number of special guests in attendance, including The Honourable Madeleine Meilleur and the outgoing President of Community Living Ontario, Dianne Garrels-Munro. In addition to the presentation of the second annual TOMORAs, there will be a number of new awards this year. The awards and their recipients are being kept secret, so come on out and be surprised! Two determined individuals took the lead on raising an unexpected $2200 for LiveWorkPlay this month! First off, Marlene The Garden Fairy hosted two "h osta bee" plant sales that raised a combined $1500. Next came LiveWorkPlay staff member Allison Moores who ran the half marathon during Ottawa Race Weekend and generated more than $600 on her giving page. Marlene thanked a very long list of helpers that included a team of volunteers from Bank of America Ottawa headquarters, Friday night volunteer Alan Clarke, the Hamilton, Curry, and Siebrasse families, and many others! 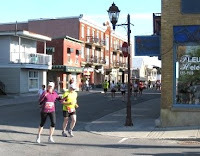 Allison would like to thank her coach Jeff Manthorpe and colleague Daniel Harris for his last-kilometre encouragement! It is not too late to make a donation and show your support for Allison's run, just stop by her giving page! 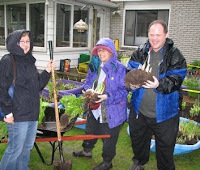 This is the first May for LiveWorkPlay as an affiliate of Community Living Ontario, having joined the federation at the beginning of June in 2008. May is Community Living Month across the province, a fact that is quite significant in communities across Ontario, but not well known to residents of Ottawa who have been without a Community Living presence for many years. This will start to change next year when LiveWorkPlay adopts some of the public awareness strategies that have been developed and used successfully by many other member associations in other communities. Of course we will also be looking to come up with some of our own fresh ideas! For 2009, LiveWorkPlay decided on a small ceremony with Ontario Minister of Municipal Affairs and Housing, The Honourable Jim Watson, MPP for Ottawa West-Nepean. This is the same Ministry with provincial responsibility for the Canada-Ontario Affordable Housing Program that has made it possible for LiveWorkPlay to offer quality affordable homes to more than a half dozen people with intellectual disabilities. As an MPP in the current legislature, Minister Watson was also part of the final closure of Ontario's mass institutions. To recognize his involvement on both counts, Moira Fuenzalida and Linda Gray presented MPP Watson with a Community Living Ontario "Opening Doors" plaque at his constituency office. Moira and Linda have recently become roommates, enjoying affordable rent that would not be possible without the capital assistance provided to LiveWorkPlay by the affordable housing program. Many members of Journeys (the LiveWorkPlay Friday night community participation program for teens) are now looking ahead to July when they will plan, prepare, and finally enjoy nights in Toronto! ACES offers an opportunity to build upon peer relationships established throughout the school year, and for individuals to test their abilities in the types of challenging situations that always occur with travel. This opportunity is made possible with financial support from the United Way/Centraide Ottawa. ACES begins with a week of planning where those going on the trip will be making many choices about what they will do as a group. In fact, with the exception of accommodations that have been booked in advance, just about everything else is up for discussion! Train or bus? CN Tower? Wonderland? ROM? There are two different ACES groups registered for the trip, and they can choose to have different itineraries, just like last year's trips to Montreal. Stay tuned to see what happens this year! Jen Bosworth is back on the job after her maternity leave, and just in time! Lately it seems "I got a job!" has replaced "I moved out!" as the hottest phrase buzzing around the LiveWorkPlay community. A new partnership with Tim Hortons franchises has resulted in paid employment for many adults with intellectual disabilities who receive support from LiveWorkPlay. Demand for paid employment is at an all-time high, and that is why Jen's position is now dedicated full-time not only to supporting people with intellectual disabilities to pursue their employment goals, but also to develop partnerships with employers who are looking for the right people for the right job! Successful networking begins at home - members of the LiveWorkPlay community who can help make connections with local employers are encouraged to contact Jen with their ideas. "All it takes is an introduction to get the ball rolling, and sometimes that leads to a paid job that benefits the individual and the employer," says Jen. "Even when that doesn't happen, an employer who knows what we have to offer may help us out by contacting colleagues that would be a better fit." 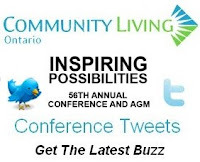 If you are unable to attend the Community Living Ontario 56th Annual Con ference in Kingston June 3-5 but you'd like to get a feel for what is happening, you can receive live updates from the LiveWorkPlay contingent on our special Twitter page! If you have never experienced Twitter, don't be afraid, there's nothing to it! Just drop by http://conference2009.liveworkplay.ca or http://twitter.com/conference2009 and follow along. If you want, you can even get the updates straight to your cell phone! LiveWorkPlay also sends out Tweets on a regular basis from http://twitter.com/getbuzzed and you can also read them from our home page, just look for the Tweet box on the right hand side of http://liveworkplay.ca. We hope you have enjoyed this 30th edition of LiveWorkPlayNews. If you have received an email about this blog in error and/or you would prefer not to receive future LiveWorkPlayNews messages, simply click here and follow the simple instructions. That same web page can also be used by newcomers who would like to join LiveWorkPlayNews, so feel free to share the address with friends, colleagues, and family who might like to subscribe. Send story ideas to Keenan Wellar.